Above we see a chart of SPY (five minute increments; blue line) over the past two trading days (4/3 and 4/4). 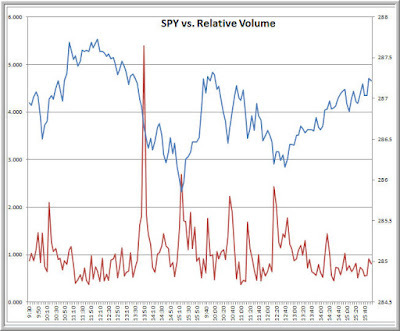 In red, we see the relative volume of SPY. This is the ratio of the current trading volume to the average trading volume for that particular five minute period. So, for example, the spike in relative volume at 13:50 PM for 4/3 tells us that the volume traded was five times the average volume that we’ve seen during that 13:50 – 13:55 PM period. Conversely, during the prior topping period, note that volume was only half or so the expected volume for those time periods. d) How the market behaves subsequently at those price levels. It is not unusual to see cycles of varying duration in which falling prices attract volume (puking) and rising prices see volume dry up. This pattern occurred on a large time scale during 2018 and during shorter time periods such as above. Skilled traders can detect transitions in the relationships among price change and volume change to profit from cyclical movements that capture bull and bear psychology.